If you haven’t heard of the Kindle , then you must be one of the few people to have missed the publicity. It is a handheld e-book reader that has captured a lot of attention. The Kindle weighs only 10.3 ounces, but can store around 200 books. It has a rechargeable battery which lasts for nearly a week, yet can recharge fully in only two hours. The Kindle uses a display technology called electronic paper or e-ink. The technology behind e-ink is interesting. The display contain many tiny balls that are colored white on one side and black on the other. To display a black or white pixel, the display rotates the appropriate ball to the properly colored side. (This isn’t a joke; the display really does rotate multi-colored balls.) The display is not backlit, but is very readable and restful. The Kindle contains a wireless modem that can automatically receive books purchased from Amazon. The Amazon wireless service, called Whispernet, is completely free with the Kindle, with no monthly or yearly fees. You can also buy subscriptions to newspapers, such as The New York Times or The Wall Street Journal . 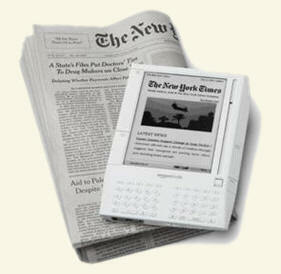 The newspapers are automatically delivered to your Kindle every morning through its wireless modem. Many people have criticized the Kindle, some for relatively minor reasons, but I quite like the idea. I especially like the concept of receiving the latest newspaper wirelessly every morning. Of course, one limitation with that is the need to have EVDO cellular service in your area. I live in one of the few areas of the country without EVDO service, meaning I would have to travel nearly 100 miles to receive that newspaper. If you ever have a chance to check out the Kindle , then you really should take the opportunity. It is a pretty impressive unit, and possibly even the future of publishing. Filed under Technology and tagged eBook.